Kim Yo Jong, Pence & Pyeongchang Politics — Choson Exchange - Visit North Korea & Support Local Entrepreneurs! Source: Yonhap. More photos here. Choosing Politburo alternate member Kim Yo Jong to represent DPRK was a good choice by the North Koreans. As a younger delegate, senior official and core family member, she is able to simultaneously command the stature of a top politician thus ensuring the right level of protocol, while presenting a younger forward-looking face to a skeptical South Korean audience. Having had personal tutoring in political economy hopefully would allow her to lead discussions on economic issues if a broader dialogue takes place between DPRK and the international community in the future. We remain somewhat skeptical of the economics curriculum at Kim Il Sung University though! Despite official statements to the contrary by the State Department, the optics of VP Mike Pence's snubs to the North Koreans are starting to look too much like snubs to their South Korean hosts. The aim was to send a message that unless denuclearization talks were on the table, there would be no broader opening. But South Korea is on the same page on this issue, and President Moon Jae In is trying hard to engender a dialogue that can lead to that discussion. So Pence's behavior might come off as being imperial. From a public relations perspective, it seems that the Moon administration is at least trying to let this slide. The Olympics only buys time for discussions behind the scenes to lead to an opening for the talks around denuclearization. If no progress is made, we can expect a resumption of testing and exercises around the Peninsula after the Paralympics. If discussions go extremely well, maybe we could see Kim Yo Jong (or others) fly in for a surprise visit during the closing ceremony and a tête-à-tête with Ivanka and/or South Korea. 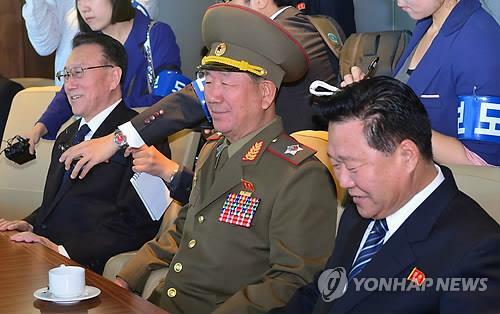 Remember the Hwang Pyong So/Choe Ryong Hae/Kim Yang Gon surprise visit at the Asian Games closing ceremony?